The Trump Administration draft budget calls for a $6 billion in resources to Housing and Urban Development. Such cuts are seen as part of long-term plan to de-fund public housing-benefits programs. BOSTON—When President Donald Trump appointed neurosurgeon and former presidential candidate Ben Carson to head the federal Department of Housing and Urban Development, many questioned his commitment to the public housing and community development programs funded by the agency. The selection of Ben Carson, who has spoken out against public benefits programs, was seen by many as a lack of commitment to [the Department of Housing and Urban Development] HUD. Last week, the Trump administration’s draft HUD budget leaked to the press showed a $6 billion cut to its $48 billion budget. That cut would force the agency to stop funding maintenance and repairs. It would also curtail it from maintaining its voucher program in the face of rising housing costs, according to Boston Housing Authority Administrator Bill McGonagle. McGonagle, who said the proposal coming from the Trump administration’s Office of Management and Budget would be a disaster, [preventing] the BHA’s ability to maintain its units. “We could not even remotely meet our core mission of decent, safe and sanitary housing,” he said. Cuts to HUD would not be limited to the BHA budget. Other city departments rely on HUD funding for programs including homelessness prevention, first-time homebuyer assistance, small business assistance and brownfields environmental clean ups. Much of HUD’s funding comes in the form of community development block grants, which allow cities and towns more discretion in how it’s used. “It’s a very flexible source of funding,” said Department of Neighborhood Development Director Sheila Dillon. Over the years, Republicans have been steadily chipping away at the HUD budget, cutting $1 billion from the agency’s capital improvement budget between 2000 and 2016. Those cuts have hit cities like Boston hard and forced some to tear down public housing developments they are unable to adequately maintain. 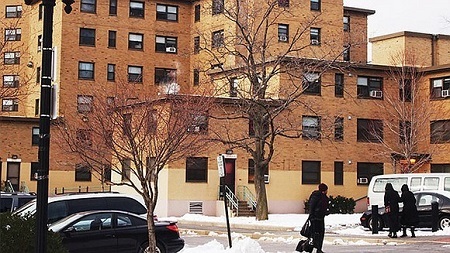 The Boston Housing Authority has turned to nonprofit and for-profit real estate developers to take over administration of its properties and perform various maintenance projects. “We’re trying to do some rather creative, outside-the-box things for our elder federal housing developments,” McGonagle said. The latest budget, hatched by arch-conservative OMB Director Mick Mulvaney, is seen by many as the logical extension of the anti-government doctrine articulated by the right-wing Heritage Foundation think tank. “This is consistent with what the Heritage Foundation is calling for in its ten-year plan to eliminate HUD,” said Michael Kane, executive director of the National Alliance of HUD Tenants. Coupled with the administration’s planned $57 billion hike in military spending and cuts to anti-poverty programs—also in line with Heritage Foundation recommendations—Mulvaney’s recommendations constitute a threat to working class people, Kane said. In Boston, as in many major urban areas in the United States, housing costs are outpacing rental subsidies, forcing low-income workers to pay a greater share of their income on rent. The gradual erosion of the HUD budget, which began during the 1990s, has exacerbated the pressure on public housing waitlists, according to McGonagle. Photo: A Trump administration budget proposal leaked to news media would cut $6 billion from the $48 billion HUD budget, affecting public housing, including the Cathedral public housing development in the South End of Boston. Source: Bay State Banner.